by Thompson Jr, Arthur; Peteraf, Margaret; Gamble, John; Strickland III, A. 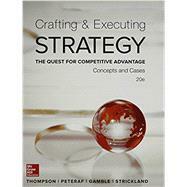 Chapter 1: What Is Strategy and Why Is It Important? Case 5: Under Armour's Strategy in 2014: Potent Enough to Win Market Share from Nike and Adidas? Case 6: Lulumon Athletica, Inc. In 2014: Can the Company Get Back on Track? Case 9: Panera Bread Company in 2014 – Can a Slowdown in the Company's Growth Be Avoided? Case 10: Chipotle Mexican Grill in 2014: Will Its Strategy Become the Model for Reinventing the Fast Food Industry? Case 11: Sirius XM Satellite Radio Inc. in 2014: On Track to Succeed after a Near-Death Experience? Case 13: Vera Bradley in 2014: Will the Company's Strategy Reverse Its Downward Trend? Case 14: J. Crew in 2014: Will Its Turnaround Strategy Improve Its Competitiveness? Case 29: NCAA Athletics: Are Its Amateurism and Financial Assistance Policies Ethical?